Recently I've fallen in love with the show Ghost Whisperer. I think I love it because it combines my love of the paranormal & ghosts with an antique store & gorgeous clothing. Though the episodes can be rather odd, I love Melinda Gordon's (Jennifer Love Hewitt) little antique shop in a small town called Grandview. I would love to own a little store with antiques & handmade little bitties. Ahhhhhh....I hope one day I can make that dream a reality. This blue & lacey slip dress from Vintage Opulence is just to die for. Do you see that color? The shape? So beautiful! In Amour sans Anguish's shop I've fallen in love with this veiled dress. I love the neckline. 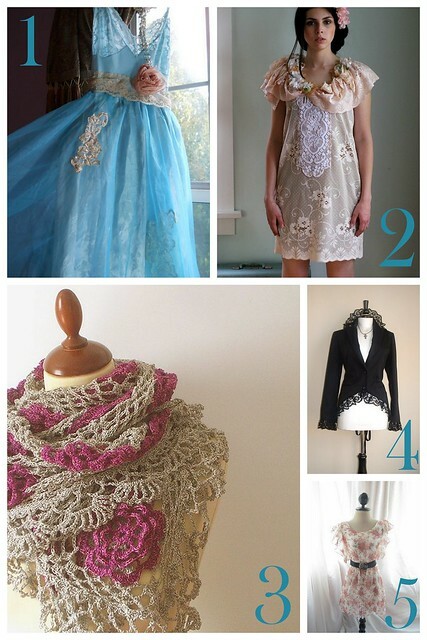 A great use of lace & color! A crocheted shawl from Call Me Mimi is perfect in its muted tones of green & burgundy. Antique Rose is a fitting name for this beauty. A great Cutaway Corset Jacket from Darkest Dreams is perfect to make these shapes & colors perfect for fall. In fact, in the episodes that are more into fall & winter Melinda wears a lot of dark colors. I love the shape & collar of this jacket. Finally, this Kimono Dress from River of Romansk has a beautiful airy feel. I love the pattern! totally love ghost whisperer! the clothes are amazing!! !